Brazil has been much in the news. As if it weren’t enough that post-Olympic budget shortfalls, political corruption, Zika and crime had combined in a toxic brew, the recent election of Bolsonaro pointed up deep-seated philosophical fears and divisions much as the Trump election did in the US. Brazilians in the creative sector have been trying to regroup, but in addition to the above they have faced devastating fires (the National Museum of Rio), burst dams, (Brumadinho adjacent to Inhotim art park), and the abolishment of the Ministry of Culture, which has been folded into a newly christened Ministry of Sport. I finally returned recently to Brazil after a long absence. As a pre-teenage exchange student in the home of a wealthy Carioca family with whom my parents had briefly met and conspired late one night undoubtedly after too many caipirinhas, I had a decidedly one-sided view of the country. As a sheltered suburban girl, suddenly I was with a posse which had free reign—underage drinking and driving, dancing ‘till dawn on Ipanema. On the wild rides to mountain homes in Petropolis we passed favelas which made me mute— Brazil was my first third world country. I returned ostensibly to study modernist architecture but my journey became a window into both politics and culture as a country’s built environment—and how it is respected— is closely aligned with the political imperatives of the day. In my view, this 20th century patrimony is as important as the pyramids are to Egypt. So many iconic structures are deteriorating and are without adequate fire protection. In Rio next year there will be a world architecture congress with government support which will address some of these issues—already a few of the most distinguished buildings are undergoing thorough, if protracted, preservation projects. Nevertheless, my day with Oscar, as I came to think of it, was every bit as fulfilling as I had imagined. Brasilia is a resounding example of the political will of principally three men—Juscelino Kubitschek (President), Lucio Costa (planning) and (architect) Oscar Niemeyer— to build a utopian mecca for a new more central seat of Brazilian government in 1956 (it had been Rio)—in just four years. Though I generally am suspicious of superstardom in architecture, here I was grateful to have this body of monumental work on display. Yes, there were manifold issues around its construction in the middle of a largely rural province. As in the construction of Gibellina Nuova, Sicily, the visionaries marched to their own drum without consulting local inhabitants. Highlights: on the Monumental Axis, the Itamaraty Palace with its splendidly thin arches, its central staircase, its Roberto Burle Marx garden; the National Congress with its pea green carpeting, brutalist hallway and starry-ceilinged legislative chamber, the Ministry of Justice with waterfalls emerging from its façade. On the residential axis, the elegant living spaces and muted colors of the Superquadras (these a true revelation), the brutalist, un-gated Mexican Embassy. (Our American Embassy has just announced a new project by Jeanne Gang. Thank goodness, as the walled, wired, hodgepodge mess there is an embarrassment. At least one good decision from the Trump State Department). In anticipation of going to Salvador, Brasilia’s polar opposite, I took an Afro-Brazilian dance class at Steps. That revved me up for the multi-culti experience of that seaside city which keeps its clock—and its energy—on a time all its own. Highlights: There is a Lele (Joao Lima) cathedral and city hall and other projects by Lina Bo Bardi, one in restoration (the museum) but others (a theater, a bar) in alarming stages of disrepair. I was very taken with the local branch of the Sarah Hospitals chain (LeLe was in the in-house architect), and a wonderful history museum, the Misericordia Hospital, evidence of the Portuguese wealth that existed when Salvador was an early capital. These are thankfully in pristine condition. A contemporary architectural intervention into an adjacent palace made the Carnival Museum a dynamic space with video exhibits which—for the first time in my experience— give dance and music a founding place in the history of a country. However nothing was as thrilling as an actual afternoon Carnival rehearsal with Olodum, the largest of the Bloco Afros. Though some claim they have become too commercial, their intense drumming and singing which revved up a crowd of locals and foreigners was entirely infectious and hardly disturbed by the defile of military police which marched through at regular intervals. ( In the town square, I saw other police routinely searching and harassing local youth. Is this a new Bolsonaro initiative or business as usual in Salvador?) Two new chic hotels are open near the waterfront (Fasano and Fera), but I stayed in the heart of the Pelourinho district at the faded but friendly Convento do Carmo which felt more in keeping with the city energy. Salvador was named one of the NYT 52 places to visit this year, but I would wait until fall as many things are under construction. I was a lesser but still mournful victim of the giant dam disaster in Brumadinho as, despite pulling every string possible, I was not able to gain access to Inhotim, the marvellous contemporary art site just adjacent which, although not damaged, was closed in solidarity. I made lemonade by adding a stop outside Belo Horizonte at Pampulha, Niemeyer’s spectacular lakeside complex—again devised in a collaboration with Kubitschek. Highlights: The museum, the church (it’s in restoration but I managed to get a peek at its famous mural), the open air restaurant, the Casa do Baile (Sanaa must have seen this one), the beach club, and the home he built for the Kubitscheks, which feels as if they might emerge at any moment, are once again vibrant examples of this giant of 20th century architecture who was able to think about intimate spaces as well as grand. I practically wept at the haunting beauty of the twelve Aleijadinho soapstone prophets in Congonhas, and arrived in the colonial mining town of Ouro Preto. (You can still stay in an original Niemeyer duplex in the Grande Hotel with one of his signature winding staircases.). I happily lost myself in the cobbled streets of the colonial town and visited the three local museums—the Inconfidencia is an excellent intervention into a former slave prison. It wasn’t until I returned to the States that I learned that Ouro is another town also directly at risk from mine disaster as is much of Minas Gerais, once the wealthiest pocket of Brazil. Arriving in Rio at the famed Santos Dumont airport was the first time I had a real chance to assess my vivid memories. The city is still so beautiful, where mountains meet the sea, but at every turn, the favelas remind of the societal disparities. (One even still bisects an extravagant private golf club.) Nevertheless, the display of modernist, art deco, and French inflected architecture is unparalleled and with the right guides one can access some hidden spaces that are an aficionado’s dream. I learned more about Lucio Costa and his Carioca school confederates Affonso Reidy, the Roberto Bros, Paolo Werneck, Jorge Moreira et al. Highlights: We went to the roof of an adjacent building for a view of the famous Niemeyer-Burle Marx Ministry of Health which was at the top of my list (closed for restoration as so many projects are, alas), explored the hidden upper reaches of the Brazilian Press Association, the perfect reinstallation of the Burle Marx garden at the top of the (very private) IRB corporation Roberto Bros designed building. The Instituto Salles was also partially closed for installation, but its outdoor spaces are elegant and well preserved in contrast to Oscar Niemeyer’s own house which, though technically in restoration by his family, is a mess. An expedition there with two intrepid architects who care deeply about its progress enabled me to see close up just how much is needed, and is not being done. Though I had written about the out of town Sitio Burle Marx, I was unprepared for its wild majesty and the many 17th century domestic structures left as Burle Marx inhabited them. The Sitio was apparently the scene of wild parties and gay life that garnered him quite a reputation at the time, but only enhanced the enchantment of this extraordinary space for me. In Rio, shorts is the uniform. In Sao Paolo people wear suits and build enormously high walled compounds. Brutalism reigns. (Again I was warned about crime, but experienced no qualms myself. 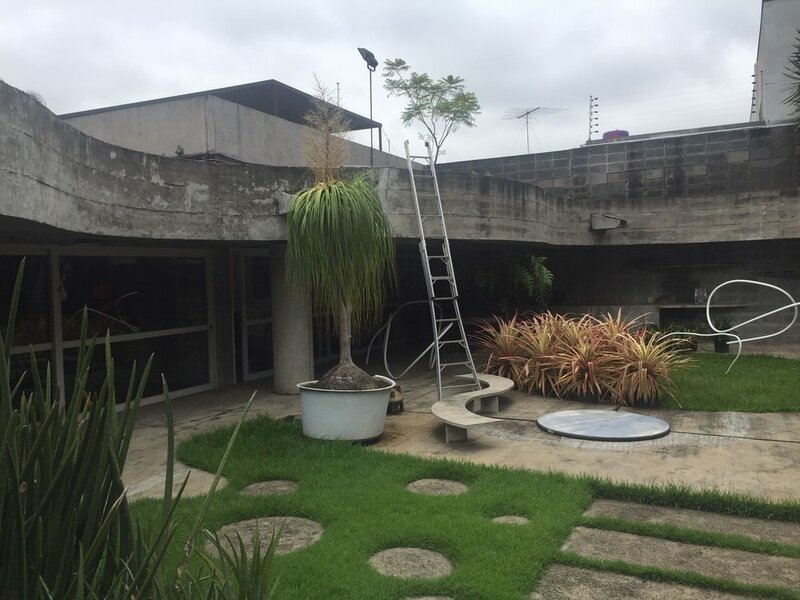 One homeowner told me he had been held up at gunpoint in his shower and had left his absolutely primo brutalist Paolo Mendes da Rocha house in the care of his brother). Mendes da Rocha himself, now 90, is, however, apparently undaunted and still maintains his modestly located downtown office. Though busy , SP certainly has a less exotic, hothouse air than Rio. Highlights: The projects of Lina Bo Bardi, the Italian architect who together with her husband Pietro commandeered the Brazilian art and culture world in the 1950’s and 60’s via the Museum of Sao Paolo, her stewardship of the museum and university in Salvador, their joint editorial supervision of their magazine Habitat, her truly egalitarian SESC Pompeia culture center and her own Casa De Vidro are still first class examples of civic and botanical engagement combined with architectural splendor (more soon on Bo Bardi). Proud homeowners welcomed me to their singular brutalist houses. Niemeyer’s grand Ibirapuera Park is vast and undergoing very slow renovation. Artigas and Cascaldi’s architecture faculty at the University is a majestic building but from my perspective, compromised by layers of apparently unrestricted grafitti. It’s in vastly better shape however than its counterpart architecture faculty in Rio. Brazil has probably the greatest concentration of important 20th century architecture as anywhere in the world. Private funding for preservation is scarce, there seems to be precious little corporate support of these structures. Mine was the only American I heard on this trip, and very little else. Argentinians were the few tourists I encountered. Many have been scared off, I imagine, by the onslaught of frightening front page news. The Brazilians are among the liveliest, most welcoming, citizens and their creative professionals among the most erudite. I urge Bolsonaro to reconsider his priorities. Brazil’s artistic heritage is one of its strongest suits and can only serve to deposit prized dollars into its coffers. I returned wanting to install ramps, winding staircases, philodendron. And a set of drums.